The RIZE is a handmade work of art that we created to showcase the amazing physical properties of ferrofluid, a strange black magnetic liquid originally created by NASA as a prototype rocket fuel. It was unique in that it could be pulled into the engines using magnets in zero gravity. It has only recently been available for use outside of industrial applications and I sought to utilize these unique properties and bring them to life visually in the RIZE. Place the RIZE on its detachable magnetic base and watch the ferrofluid spike, spin and rise in a beautiful symphony of art and science. Its movements are mesmerizing and it will be the center of attention wherever it's displayed. The top cap and body are constructed of T8 anodized aluminum for a beautiful finish. The glass tube is custom made from a highly polished laboratory grade glass with thick walls that is not easily broken. The machined stainless steel magnetic base is a work of art in itself and serves multiple purposes. 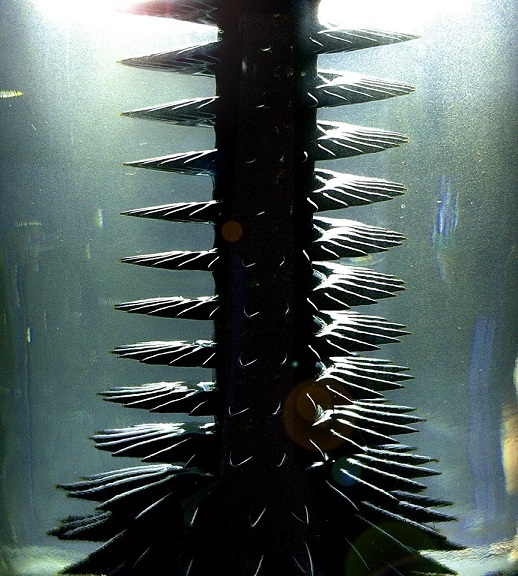 We only use high quality ferrofluid manufactured by Ferrotec. 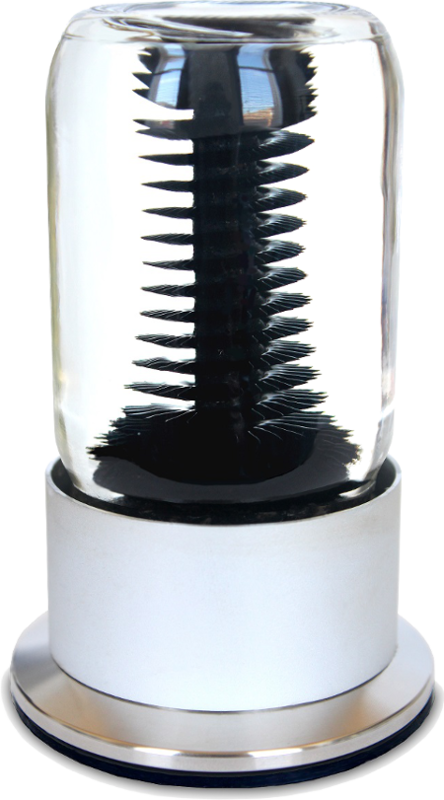 The centerpiece of the display is a large machined black oxide coated screw which will never rust or react with the ferrofluid. We have worked extensively in R&D to develop a custom suspension liquid that ensures the ferrofluid won't break down or stain the glass. We are now able to color the ferrofluid in vivid metallic colors. The RIZE makes for the perfect desktop distraction. A powerful dual pole handheld magnetic wand is included for added interaction. Will the ferrofluid break down? One of the main problems when working with ferrofluid is that it quickly breaks down in the presence of most other liquids and stains anything it comes in contact with (including glass). To solve this problem we have conducted extensive R&D and have developed a proprietary suspension liquid that keeps the ferrofluid from breaking down or staining the glass. You should expect years of spiky goodness from your RIZE unit. Yes, we can currently ship using international priority 6-10 day and are getting distributors ready for lower shipping prices in the EU and UK. Will it wipe my hard drive? Nope. If your hard drive was made after the year 1999 then you are completely safe. The data density for new drives is so dense that even a very strong generalized magnetic field will not cause any damage to the drive. You should keep all metal objects at least an inch or two away though just for good measure. Yes, if your RIZE doesn't arrive in perfect condition let us know and we'll send you a new one asap. The spinning time varies, but after it's placed on the magnetic base it usually spins for a few minutes before slowing down and stopping. You can also restart the spinning motion using the handheld magnet. They are not flammable but you should definitely not drink them. The bottle should never be opened, and if it is broken (which is unlikely because it's very strong) immediately clean up the spill using dish soap and water. Ferrofluid will stain anything it touches very badly. Does it use batteries or plug into the wall? Nope, the RIZE contains no moving parts. Only pure physics is used to create the amazing spinning, anti-gravity rising motion.